Given name Katsushika (originally Nakajima) Tamekazu. Go: Fusenkyo, Gakyojin, Gakyo Rojin, Gumbatei, Gyobutsu, Hishikawa Sori, Hokusai, Iichi, Kako, Katsukawa Shunro, Kintaisha, Kuku, Manji, Manjio, Manji Rojin, Raishin, Raito, Ryosen, Shimpaku Sanjin, Shinsai, Shunro, Sori, Soshunro, Taito, Tatsumasa. (Used over 50 go, of which the above are the most common.) Ukiyo-e painter, printmaker. Lived largely in Edo. Adopted son of the mirror maker Nakajima Ise. Trained as an engraver; also learned to cut wood blocks for prints, apparently the only artist of his time to do so. At 18 learned to design actor prints from Katsukawa Shunsho; given the go Katsukawa Shunro, under which he also produced illustrated kibyoshi. In 1785 quarreled with Shunsho and was dismissed from his studio. In 1787 began to sign Hishikawa Sori; about 1797 began to use the go Hokusai. 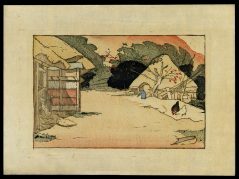 From about 1795 to 1806, under the go Gakyojin, Hokusai, Kako, and Sori, worked in a romantic manner turning out surimono and illustrated volumes of verse. Next, under the influence of Chinese-style landscapes in book illustrations by Ooka Shumboku and others, introduced landscapes into his own works, producing pictures of famous places. In 1814 the remarkable Manga volumes began to appear. By 1816, using the go Iichi, was doing some of his finest paintings, including the great landscapes; also the fine kachoga prints. In 1817 to Nagoya to work; in 1818 visited Osaka and Kyoto. After 1820 all the great sets of prints, such as Thirty-six Views of Mount Fuji, began to appear. By 1835, using the go Manji and Gakyo Rojin among others, worked primarily as a painter. His life unsettled, with frequent changes of residence and two marriages, but even so a prodigious output of prints, sketches, paintings—perhaps 30,000 in all. Many pupils. One of the great draftsmen of the world; worked in many styles, even that of Shiba Kokan, the exponent of Western perspective. Very daring landscapes and seascapes. Always inventive, fascinating, dexterous. Taken in whole, or in part from: Roberts, Laurance P. A Dictionary of Japanese Artists: Painting, Sculpture, Ceramics, Prints, Lacquer. Weatherhill, Inc: New York. 1986.